While he avoided terms like "transformational," Obama signaled that he still hopes to accomplish big things in spite of Congress' almost paralyzing partisanship. That could include an overhaul of immigration laws, which could become a coveted bookend to his 2010 health care revision. 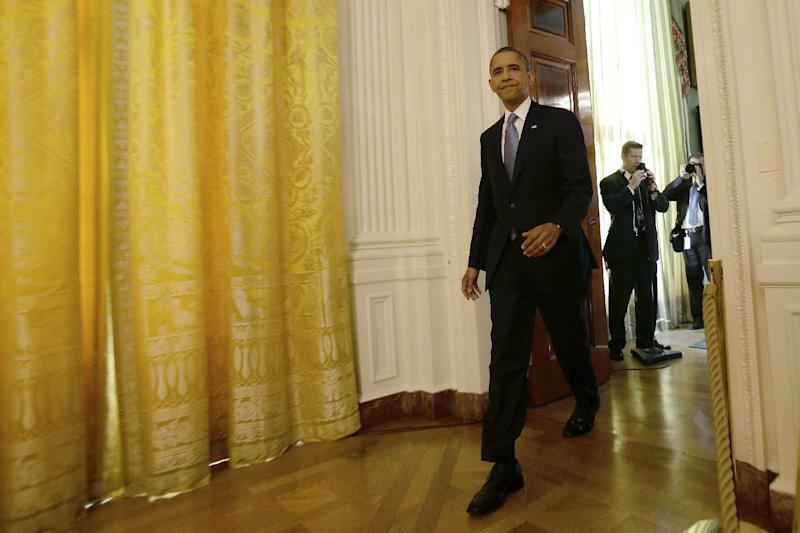 There was a bounce in Obama's step Wednesday in the White House East Room. But there was no dancing in the end zone, no taunting of defeated opponents. He jokingly claimed he forgot about the election the day after it ended, so eager is he to plunge into his second-term agenda. Obama said he is willing to work with Republicans to head off the worrisome package of big tax hikes and program cuts scheduled to hit in less than seven weeks. But he reiterated that wealthy households must pay higher tax rates, something GOP lawmakers fiercely oppose. After all, Obama said in tone, if not exactly in words, he defeated Mitt Romney last week running on that platform. But he stopped short of mimicking past presidents who have claimed wide-ranging mandates. He avoided the newly re-elected George W. Bush's 2004 boastful vow to start spending "political capital." Obama is well aware that Bush quickly suffered a stinging setback when Americans rejected his bid to partly privatize Social Security. "I've got one mandate," Obama said. "I've got a mandate to help middle-class families and families that have been working hard to try to get into the middle class." The president, a history student who reportedly ponders where he might rank among presidents, said: "I'm more than familiar with all the literature about presidential overreach in second terms. We are very cautious about that." "On the other hand," he said, "I didn't get re-elected just to bask in re-election." If Obama struck a seemingly conciliatory tone on domestic issues like the "fiscal cliff," he glared defiantly when he verbally smacked down two Republican critics — including Sen. John McCain, whom he defeated for president in 2008 — on a contentious foreign matter. "If Sen. McCain and Sen. (Lindsey) Graham and others want to go after somebody, they should go after me," Obama said in his most animated moment. The two senators have harshly criticized U.N. Ambassador Susan Rice for her role in describing the deadly Sept. 11 attack on the U.S. Consulate in Benghazi, Libya. "To besmirch her reputation is outrageous," the president said. Every president has more leeway in handling foreign policy than domestic issues, which helps explain Obama's fiery comments. They hinted at a possible Senate showdown if he nominates Rice to be secretary of state. The most pressing matter facing Obama is the looming fiscal cliff of big tax hikes and spending cuts. Both parties agreed to the unsavory package as a poison-pill incentive to spur lawmakers to reach a big deficit-reduction deal, which they promptly failed to do. Economists say the fiscal cliff package, which takes effect Jan. 1 unless Congress acts, could trigger a new recession and wipe out hundreds of thousands of jobs. Obama, who was to meet Friday with Congress' top leaders, was measured in discussing the upcoming negotiations. His body language suggested compromise. His words, however, were sometimes vague, even contradictory. He said he still insists that couples making more than $250,000 a year pay a higher marginal tax rate than the current 35 percent, the level set by the Bush tax cuts of 2001 and 2003. Moments later, however, he said he was "open to new ideas" about adjusting the rates, provided they help produce substantially more revenue to fund the government. Perhaps nothing could burnish Obama's legacy more than an overhaul of immigration laws that would somehow grant legal status to millions of illegal immigrants without triggering widespread anger over "amnesty" for lawbreakers. The closest Obama came to rubbing Republicans' noses in their recent election setbacks was when he leapt at an immigration question Wednesday. "I'm very confident that we can get immigration reform done," he said. Shortly before the election, he noted: "I predicted that the Latino vote was going to be strong, and that that would cause some reflection on the part of Republicans about their position on immigration reform. I think we're starting to see that." An immigration package, he said, should improve border security, penalize companies that purposely hire illegal workers and provide "a pathway for legal status for those who are living in this country, are not engaged in criminal activity, are here to, simply to work." Similar ambitions proved impossible for Bush, McCain and scores of other politicians. 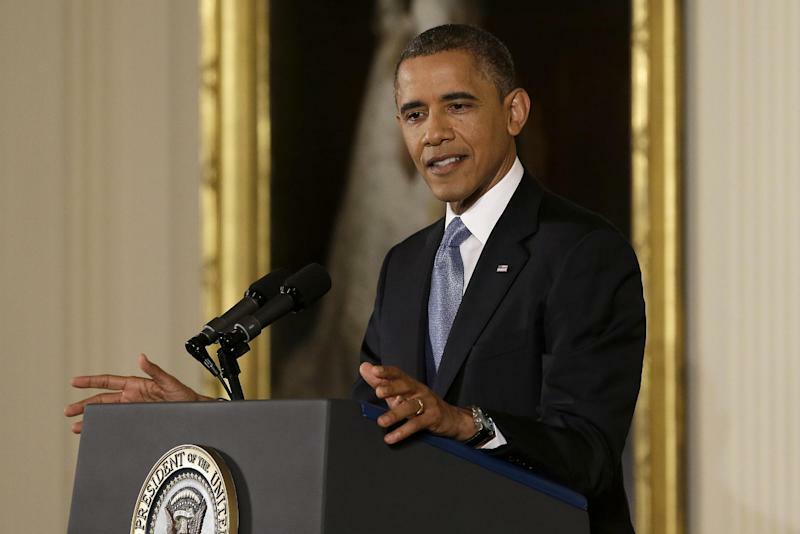 It's unclear whether Obama's re-election can provide enough impetus to overcome the many hurdles still facing the quest. Obama's success in dealing with immigration and other issues will depend partly on how much partisan anger results from the fiscal cliff showdown and whether the economy continues to recover in 2013 and beyond. Setbacks on these fronts or others could force Obama to play political small-ball, as many people accused President Bill Clinton of doing in his second term, dominated by scandal. If ever there's a time for a president to aim high, it's immediately after his election to a second and final term. And so Obama joked with reporters Wednesday, hinted at economic compromises without making specific concessions and lashed out at critics of his ambassador to the United Nations. "I want a big deal," Obama said. He was referring to resolving the fiscal cliff. The sentiment, however, might apply to his entire presidency, which just doubled in length, promising all sorts of possibilities and challenges from now until January 2017. EDITOR'S NOTE — Charles Babington covers Congress and politics for The Associated Press. Follow him on Twitter: https://twitter.com/cbabington .